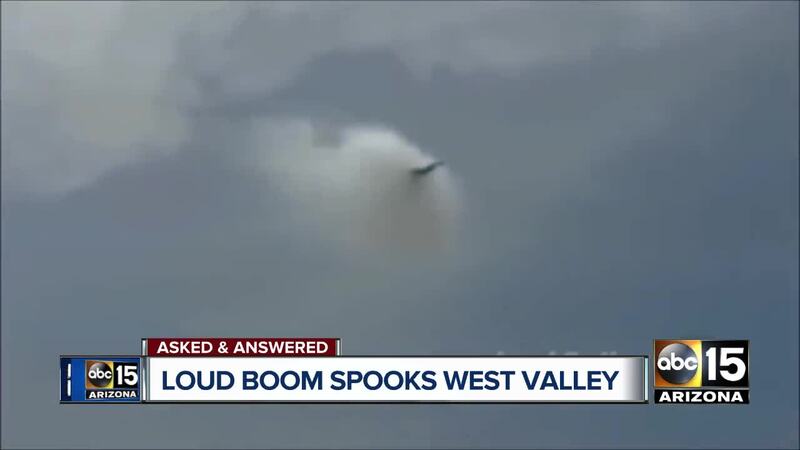 A large boom in the Surprise area was caused by an F-35 jet breaking the sound barrier. ABC15's Cameron Polom has the story. SURPRISE, AZ — It was a calm Thursday afternoon in Analisa Ceballos' Surprise neighborhood last week, the Christmas rush finally coming to an end. "I was sitting in the living room around four o'clock, everybody here was taking a nap so it was nice and quiet for the first time and all of a sudden there was a really loud boom," Ceballos said. Ceballos says it was unlike anything she'd ever experienced. "Like my window started shaking, my door opened," Ceballos said. She says the shaking permeated throughout her entire home. "Honestly I thought it was an earthquake, it scared the crap out of me so I had no idea what was going on." Miles away Emmalee Flores, Ceballos sister says she heard and felt it too. "I just heard a big huge boom my entire house shook, like all our windows all our doors, my dog went crazy," Flores said. They immediately texted one another. "And at the same exact time we sent the same exact message I said was that an earthquake did you feel that," Flores said. Social media flooded with similar questions. Folks experienced the same thing from Surprise, to El Mirage, to Sun City. The United States Geological Survey was tracking no earthquakes in the area. Others wondering if it was thunder but there wasn't a cloud in the sky. What it was, was likely an F-35 out of Luke Air Force Base breaking the sound barrier. Several people reported seeing one right before the sound. We reached out to Luke Air Force Base who says it was likely one of their aircraft in the area but couldn't be 100 percent sure. They also could not confirm the speed in which the possible aircraft was traveling. A sonic boom takes place when jet flying over 770 miles an hour produces a sonic boom, sending a shock wave that can travel miles. "I've lived here all of my life and we've had the jets come by all the time random hours but I've never felt anything like that," Ceballos said. And it may not be the last time. Surprise comprises a large swath of Luke's overflight operations where the jets are a common sight. But as common as it might be, there's not much than can prepare you for hearing and feeling that kind of power in person. For more information on the overflight areas click here .